Previous What’s Coming During Gen-Con 2018? Just when you think you've mastered kingdom building and maximizing your territories, there's a disturbance in the land. A large shadow extends from the horizon. You squint, trying to make out the looming figure moving toward you. Is that…? Could it be…? 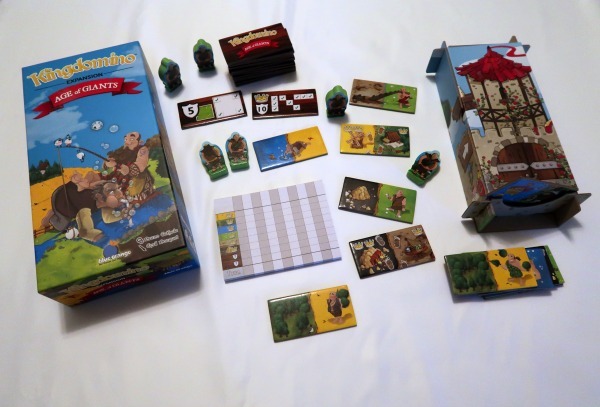 We received an advanced review copy of Kingdomino: Age of Giants. This post contains affiliate links which means we may earn a small commission if you make a purchase. Kingdomino: Age of Giants is a new board game expansion by Blue Orange Games that will be released at Gen Con 2018. It can be played as an expansion with Kingdomino or Queendomino and allows you to include a fifth player. It also gives you the ability to lightly interfere with other players by sending a giant meeple to their kingdom. What's included in the Age of Giants expansion? If you're like me, you will be quite excited about the domino tower. The domino tower is nice for dispensing the tiles for each round. Plus, the magnet closure ensures the box opens and closes nicely. It perfectly fits all of the dominoes from Kingdomino (or Queendomino) along with the new Age of Giants tiles. The new domino tiles feature giants and giant footprints. You'll also receive six giant meeples, two brown king meeples, a brown castle, a brown starting tile, challenge tiles, and a score pad. The challenge tiles provide opportunities to gain additional points. They can alter your strategy and potentially launch your score into first place (even if you have a kingdom full of giants). If you are already familiar with Kingdomino or Queendomino, the game play is mostly the same. 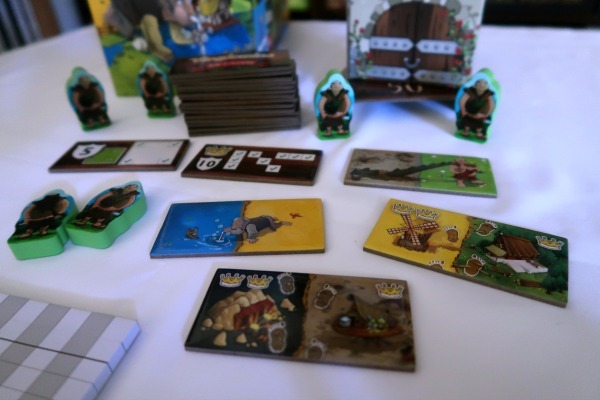 Age of Giants integrates well with either game, making it easy to add on and teach to others. The main changes are the two challenge tiles drawn at the start, the number of dominoes drawn each round, and the giant meeples. In Kingdomino: Age of Giants, five dominoes are drawn regardless of player count. However, if you have less than five players, one or two tiles will be discarded before players choose theirs. This ensures the giants will come into play. If you have 2 or 4 players, then you will discard the middle domino tile. If you have 3 players, then you will discard the second and fourth tiles. From there, selecting tiles and adding them to your kingdom remains the same. Well, until you play a giant tile. When you add a tile featuring a giant to your kingdom, take a giant meeple and place it on one of your crowns. My strategy is to pick the crown that will impact my score the least because if the giant never leaves, that crown doesn't count during scoring. If you do not have any crowns on your board at the time you play a giant tile, you do NOT add a giant meeple. When you place a tile featuring giant footprints, you send one of the giants from your board to another player's kingdom. You decide who will receive your giant meeple, but they decide which crown to place it on. If you do not have any giants in your kingdom when you play a footprint tile, you do NOT get to send a giant to another player. We've enjoyed playing Kingdomino: Age of Giants several times and you can watch us play a three player game with our daughter in the video below. First off, if you haven't played Kingdomino with your kids yet – what are you waiting for? It's an excellent board game for families. 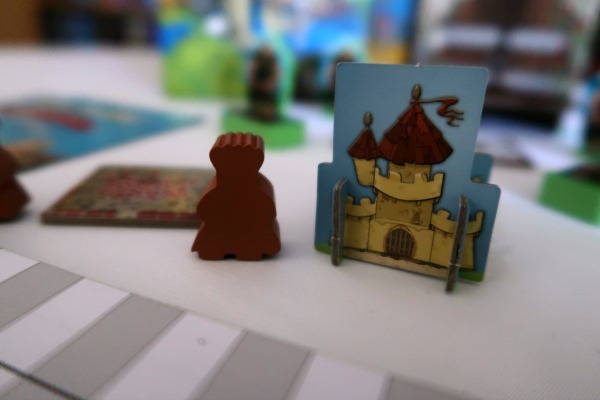 The simplicity of Kingdomino's rules and scoring make it perfect for kids. Don't let that simplicity fool you though – there is still some strategy mixed in with luck of draw. I think Age of Giants is the perfect expansion because it adds just enough without overdoing it. It's also a great way to raise the difficulty level and strategy of Kingdomino. I actually think Kingdomino played with Age of Giants is a good way to work up towards Queendomino, especially with younger children. Queendomino includes more strategy, actions per turn, and ways to earn points. So far we've only played Age of Giants with Queendomino once (you can watch our two person playthrough on Twitch here). It definitely added more difficulty! It's an expansion that works nicely with either game without altering it too much. Plus, it doesn't feel like it filled in something the base game was lacking. You won't feel as if you could never play the base game on its own again. While you are competing against other players for the highest score, the base games are focused on your own kingdom building. Age of Giants provides more player interaction that creates scoring obstacles for other players. 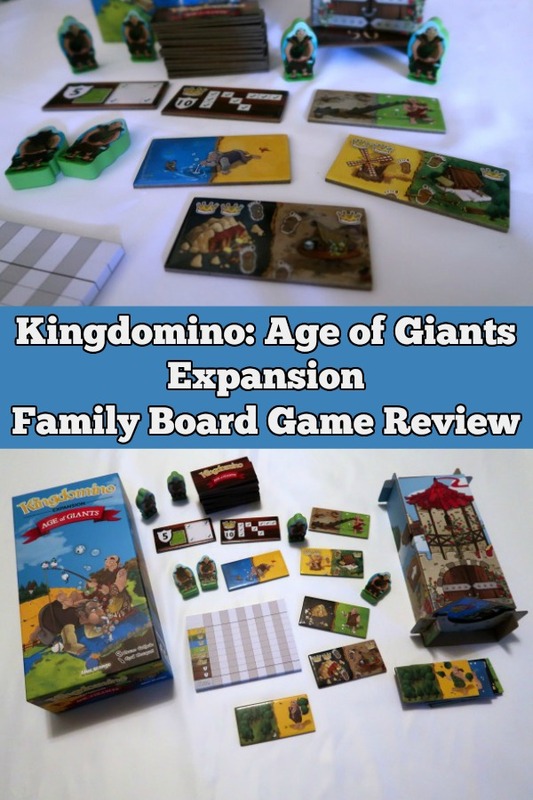 Overall, we recommend adding Kingdomino and the Age of Giants expansion to your family board game collection. You can learn how to play within a few minutes and you can play an entire game in less than 30 minutes (even if you start to over analyze your options like I do sometimes! ).